Explore the numerous day-trip ideas around Pompeii: Paestum Ruins (in Paestum), Ravello (Villa Rufolo & Villa Cimbrone Gardens), Spiaggia del Fornillo (in Positano) and Duomo di Sant'Andrea Apostolo (in Amalfi). 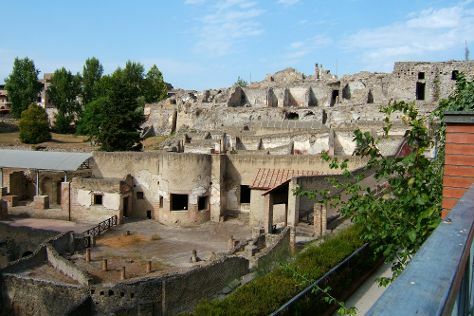 It doesn't end there: explore the ancient world of Gli Scavi Archeologici di Pompei and contemplate the long history of House of the Faun (Casa del Fauno). To find where to stay, ratings, reviews, and other tourist information, go to the Pompeii travel guide. Salzburg, Austria to Pompeii is an approximately 7-hour combination of flight and train. You can also drive; or take a train. Prepare for a bit warmer weather when traveling from Salzburg in June: high temperatures in Pompeii hover around 32°C and lows are around 21°C. Wrap up your sightseeing on the 18th (Sat) early enough to travel back home.